The new IP68 (protection against dust and protection against water for continuous immersion) Diamond connector MIL-83526 DM with DM insert (Diamond Multipurpose) permits optical plug-in connections with phenomenal performance. The connector was designed specially with harsh environments and other challenging applications in mind. The MIL-83526 DM (Diamond Multipurpose) has over four (4) terminations which use the Diamond two-component ferrules. 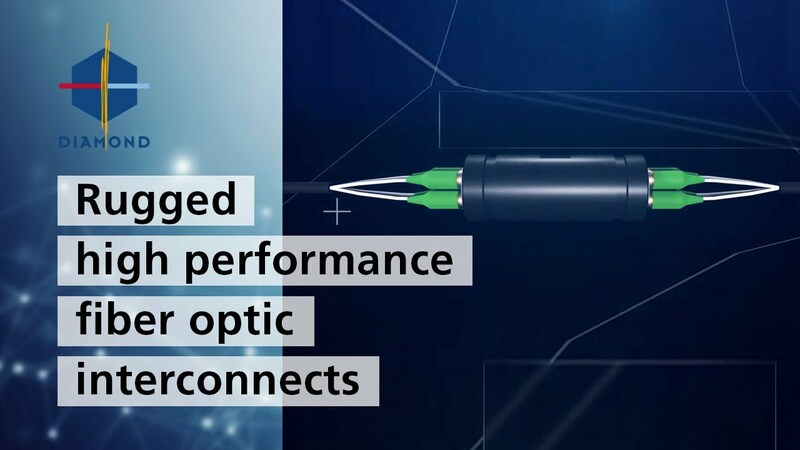 The company’s own ACA (Active Core Alignment) process was used in the development of the connector to guarantee an unparalleled concentricity of the fibre core. The connector is also fitted with electrical contacts for hybrid E/O applications. The MIL-83526 DM is available in versions for MM, SM (PC/APC) and small-wired single-mode fibres, polarisation-maintaining fibres (PM), Power Solution (PS) connector systems were developed for high-performance applications up to 3 Watt optical power. The Diamond terminations can be spliced in the field using the Diamond ZEUS D50 RU fusion splicing device. This makes repairs during running operation and customer-specific assembly no problem at all. The digital video inspection microscope kit and the cleaning set protect the devices from contamination, as this is usually the most frequent cause of problems in optical networks. Proactive inspection and cleaning of the FO connectors can prevent a worsening of the signal performance, damage to equipment and network failure times.